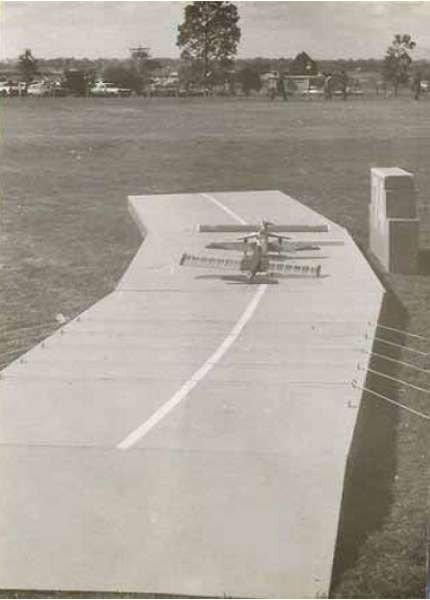 At some time in the 1950’s, the Eastern Suburbs Model Aero Club (ESMAC) obtained the plans for a 60 foot line radius Carrier Deck, complete with arrestor ropes, superstructure, etc. 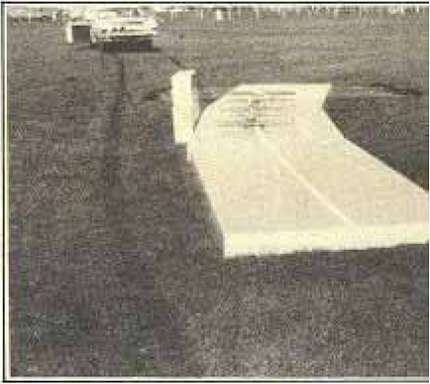 It is pictured here at the Albert Park flying field, on the edge of the lake. 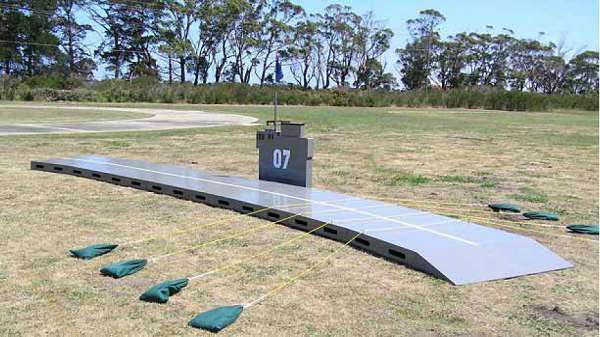 Contestants were scored for a low-speed run, a high-speed run, then a successful landing on the deck with arrestor hook dropped and extended. The Roberts third-line control system was used almost exclusively, with only a couple using the floating bellcrank system. Unfortunately, following construction and when fitting the ropes, the designed 5 pound weights were apparently not available, but 15 pound ex-window-sash weights were! So, three ropes were attached to just one 15 pound weight at each end – 5 pound per end per rope – right? An effective 30 pound arresting weight per rope instead of the designed 10. The error was eventually discovered, but only after countless models had their arrestor hooks ripped out! Even models using only their undercarriage for being arrested suffered damage. This deck was subsequently used for many, many years until it literally rotted away. Somebody built it! And painted it too. 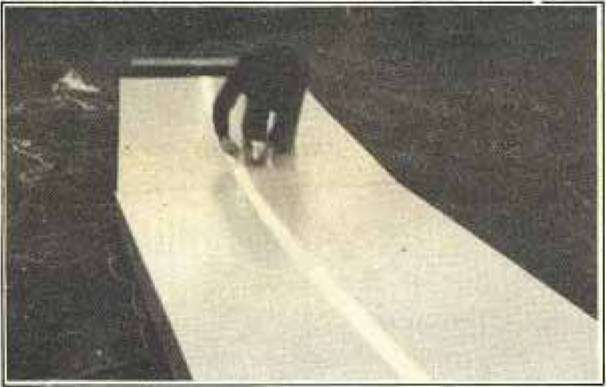 A worker applies the centre line stripe. Preparing Carrier for use. 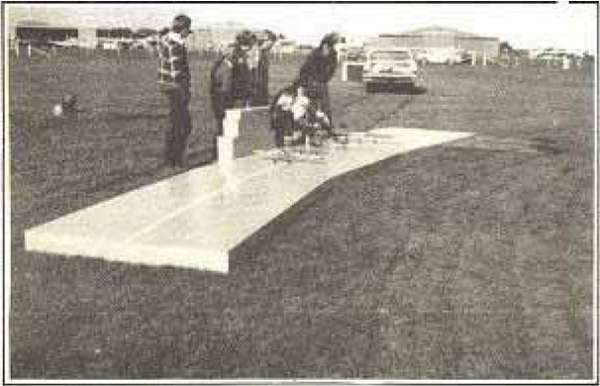 Victorian Control Line Aeromodellers. Other Clubs could follow suit and enjoy this variation on Control Line. Made in three sections, deck is transportable. Curved deck matches perimeter of circle. The VCLA Carrier Deck was built in 1974. 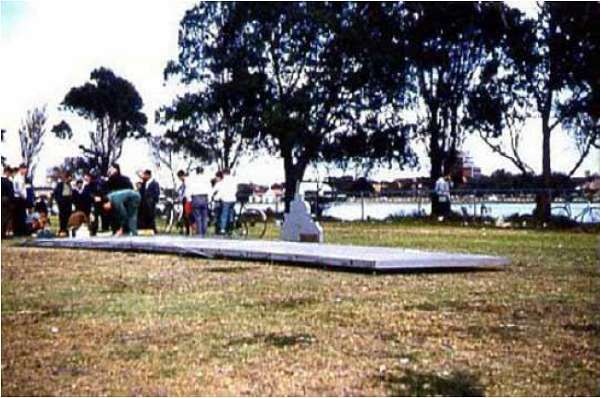 Construction of the Deck was instigated by Andrew Keillor who flew Carrier in England before moving to Melbourne in the early 70’s. The Deck measured 30′ x 5′ and was constructed of hardwood and particleboard, it consisted of three 10′ x 5′ sections which made it quick to setup but heavy and cumbersome to transport. Regular contests were run by members of CLAM through the 1970’s and were well supported. The excellent “GS” Bearcat, Corsair and Skyraider semi scale profile carrier kits which were available at the time seemed to be the most popular type of model flown, engines used were mostly HP, OS or Enya 40’s.. Interest in the event faded in the 1980’s resulting in the deck slowly rotting away. Thirty years on and CLAMF Aerosports has decided to commence regular Navy Carrier operations once again. Flying consists of a takeoff from the forward portion of the deck followed by high-speed flight of seven laps. 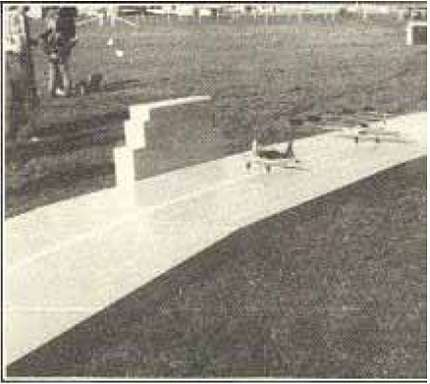 After the high speed portion of the flight, the contestant slows the model and signals the low-speed of the event (seven laps). When slow flight is complete, the contestant lands the model on the aft portion of the deck so that the tail hook on the model catches one of the arresting ropes. The ropes are tied to sand bags which stop the model. 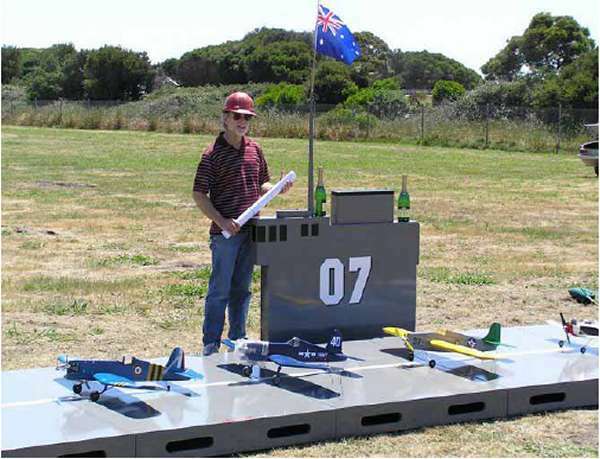 Navy Carrier forms an integral part of the Club’s ‘FUN’ strategy (F2A, F2B, F2C, F2D, FUN) in a move to promote control line flying. 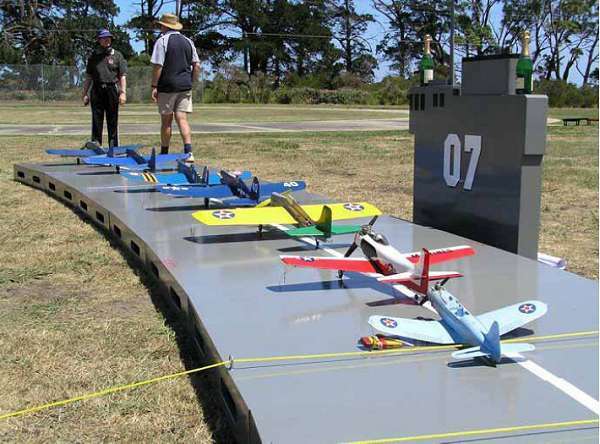 CLAMF Aerosports still retains focus on FAI F2 style competition Aerosports. 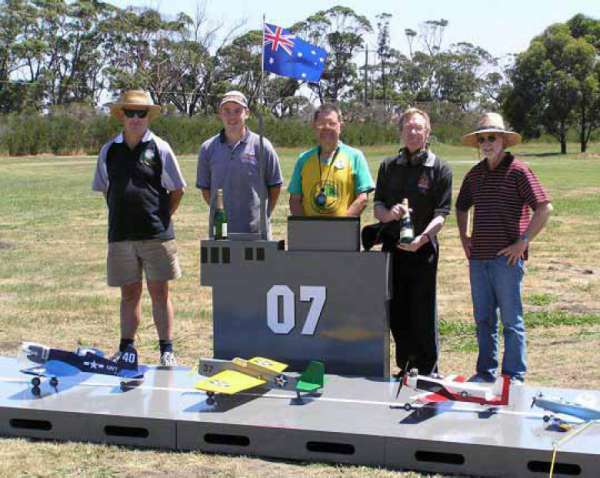 CLAMF Aerosports members have constructed a state-of-the-art 8 section deck totalling 32 feet (9.75 metres) in length specifically for the event. See picture below. Certification Crew – L-R Graeme Wilson, Murray Wilson, Robin Hiern, Harry Bailey – with champers!!! – and Peter Roberts.